I have to confess that I do have a ‘bit of a thing’ about penguins. I absolutely adore the little birds and tend to share this love with my two little girls, so whenever we see a book about a penguin we have to buy it! 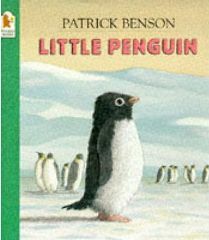 ‘Little Penguin‘ is written by Patrick Benson and is a picture story book published by Walker Books. It tells the story of Pip, who is an Adelie penguin living in Antarctica and she is three years old. Coincidentally, my eldest daughter was also three when we first read this and she loved the fact that she and Pip were the same age! Anyway, Pip goes on with her exploring, skidding, sliding and somersaulting all over the ice and snow singing to herself as she goes. Eventually she jumps into the sea with a big SPLASH. Here she sees big fish and little fish and wonders why there is such a difference in their size. Then the biggest surprise of all – she comes alongside something incredibly large floating in the sea! She climbs up on it, stumbles and slips, falling back in the water and as she plunges down deep she sees a large eye looking at her. The large floating thing is only a huge sperm whale! They make friends and play together and Pip is amazed to discover that her new friend is also three even though he is enormous! After having lots of fun together, Pip says goodbye because she has to make her way home. On her way she passes the three year old Emperor penguins again but now looks at them in a very different light, thinking that they’re not so big after all!! I think this is a wonderful book to share with young children, and not only because it is about penguins! It helps children to understand that we are all different to each other, but also the same in lots of ways! My daughter loved the fact that they are all three and that she was the same age as the enormous sperm whale! I think that it would also help children who maybe for some reason feel different to other children, to understand that we are all special in our own way. The illustrations of the penguins and the whale (all by Patrick Benson) are lovely and show wonderful expressions on all their faces. The pictures are quite simple but do convey successfully a life and vitality to the creatures. This is basically quite a simple story but it is also a lot of fun and I’m sure that it’s one that most children can relate to and enjoy! No Comments on "Little Penguin"